It is that time of year again – back to teachers, back to books, and back to report cards. Bringing the report card home can be anxious time for students, but report cards are an important tool for the parents, the student, and the teachers to be able to measure progress and success. Here at Casey Trees, we are also concerned about report cards. In spring 2009, Casey Trees launched the first annual Tree Report Card, the only independent evaluation of the District’s trees and tree canopy. As our mission is to restore, enhance, and protect the tree canopy of the Nation’s capital, knowing how that canopy is doing is very important to us. 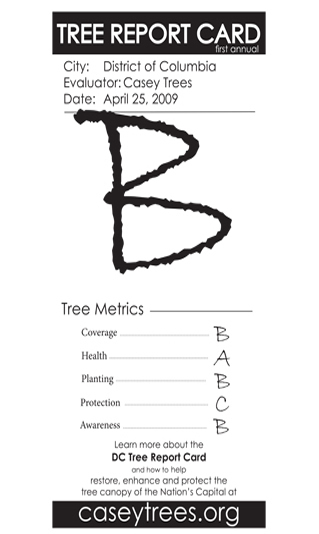 The first Tree Report Card yielded an overall “B” grade – not bad at all (something most students would be pleased to bring home). The Report Card did however identify some weak areas and areas for improvement. In April of 2008, Mayor Fenty announced a Tree Canopy Cover goal for Washington, D.C. The goal is to have 40% of the land area of D.C covered with tree canopy by the year 2035. This will require the planting of 8,600 trees per year for 25 years. It is pretty tough to cram for that kind of test. Please help D.C maintain a great grade for 2009 and volunteer to plant trees with us this fall. You can sign up for Tree Planting and Care events on our web site sign-up tool. Thanks for helping us achieve our mission, and for helping DC’s tree canopy get a good grade for 2009. Good luck to all of our students as well; best wishes for success in the 2009-2010 school year.